Getting a good workout begins with having the right equipment for the job. The Stamina X Air Rower is an excellent choice for anyone at any level of expertise. Whether you’ve been working out for a while or you are a beginner, this machine is perfect for simple and more complex exercise routines that take your workout to the limit. 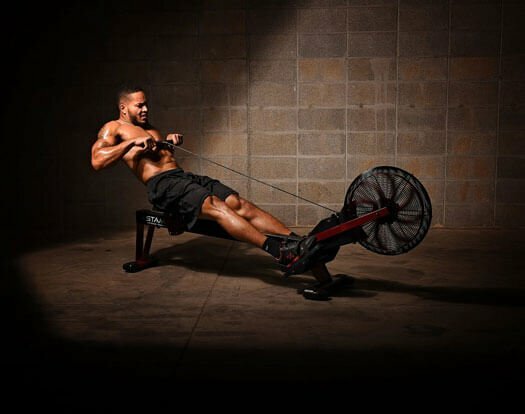 This rowing machine is precision engineered and designed to deliver the same results you’d get in a commercial gym but with a more affordable price. You’ll be amazed at the workout that your body gets from the air resistance generated by the sturdy and dependable rowing chain. Push your body to its limits with just the right amount of resistance for whatever level you are at in your fitness and exercise plan. You’re in control of extremity of your workout to get the results that you desire without the worry of putting too much strain on the chain. The molded seat is designed to be form fitting and to provide comfort and support while you’re doing your workout. A big improvement over hard and poorly fitting seats that can cause discomfort and distract you from your workout. This feature helps you to direct your attention to what you’re doing without distraction. The Stamina X Air Rowing Machine is your choice for the best results and the most enjoyable sessions with a smoother rowing glide. The padded rowing handle cuts down on slippage and discomfort in intense workouts that can lead to the formation of blisters on the hands and fingers. No matter how intense that your session becomes, you can depend on a firm grip with added comfort for a full body workout without the need to stop to make minor grip adjustments. The pivoting footplates are a new innovation in the Stamina X Air Rower. The previous version had fixed foot plates which do not move. This new and improved edition features foot plates that move with your every movement for more ergonomic positioning. This gives you greater comfort and an ideal setting for achieving the best results whether cardio or strength training. The steel frame construction of the Stamina X Rowing Machine makes it durable and tough to stand up to repeated hard use. The price is low but the quality is not. You’ll get years of reliable and dependable use from this well-built equipment that has been designed to hold up under exuberant workout conditions without failure. The truth of the matter is that you’re more apt to give it all you’ve got when you trust the reliability of your equipment. When you’re done with your workout the Stamina X Air Rower folds up into a compact size for storage. The addition of built-in wheels makes it easy to move from one area to another. Fast and easy to set up and to put away, this rower is designed to be a space saver that is convenient for people who live in small spaces such as apartments or boarding houses. The Stamina X Air Rower delivers on quality in design and construction for a solid and thorough workout that is comfortable and productive. This is the perfect unit for anyone who needs the basic equipment to get a good workout and doesn’t have a lot of space for storage. It’s an attractive machine with the red and black decor and fits into most any decorative scheme. Size fits most people up to 250 pounds and 6 ft 5 in. Question: Is it difficult to assemble? Answer: No, The Stamina X Air Rower is easy to assemble. It takes a little longer if just one person does it. The extra set of hands makes it go much faster. Question: How durable is the Stamina X Air Rower? Answer: The high-quality features found in the Stamina X Air include a steel frame, metal chain and metal rollers. The device is little expensive than other rowing machines. These features make it very strong and durable even under intense use. Question: I love the way an air rower gives rewarding breeze that hits you as you pull back. The fan here looks a little small.Does it provide a good breeze? Answer: The fan provides a great breeze! It’s just the right amount of tension on this rower and after 40 mins you’ll have a nice lather going. Question: What part of the body does this exercise?Back?Lower back? Answer: If done correctly it works upper and lower body. It works the upper body a little more but you will get the legs involved with every stroke. 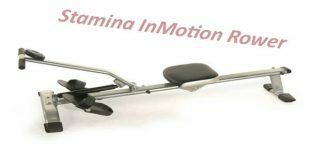 The Stamina X Air Rowing machine is not an elaborate model because it doesn’t have the prosperity of modern technology such as a heart monitor, but it does have a data monitor which is useful. For the price, it is an affordable machine that is well built with high-quality materials and craftsmanship. The pivoting footplates and molded seat are features that make this sturdy machine an excellent value for the cost. It delivers the elements that are necessary for a good workout for cardio building and strength training. Next Does Rowing Machine Help To Lose Weight?